If you’re looking to buy toner for HP Color LaserJet 8500 printers, look no further than 1ink.com. Our cartridges are capable of delivering the performance you need from this incredible workgroup laser printer. This device prints up to 24 pages per minute and offers optional duplex (double-sided) printing for fast, easy completion of any project. With a printer like this, you need a toner you can depend on. 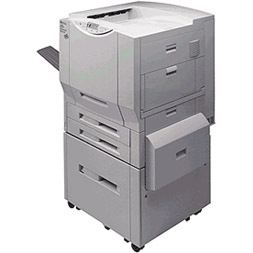 Original equipment manufacturer (OEM) HP cartridges work great, but they cost more than many businesses can afford. When you need affordable toner that produces quality work, you need a cartridge from 1ink.com. We have everything you need to keep your office running. Our remanufactured HP toner cartridge was designed to install and perform just like OEM cartridges. You’ll get the same product specs and the same outstanding print quality, but our toner will help you save up to 85% off the OEM cost! Our toner is safe to use in your compatible printer and it will not void your warranty. You’ll enjoy all the perks that OEM HP C4149A toner cartridges offer while reaping incredible savings at 1ink.com!